Second annual BigCommerce web design competition has reached the final stage, and Studioworx is represented in the finals with the KidsChoo website (www.kidschoo.com)! We have been selected to enter final competition as a part of the group of 27 websites based on BigCommerce eCommerce platform. Initially, there were over 1000 participants, and being selected by the jury to enter the finals is a success that not many web agencies are able to say they achieved! 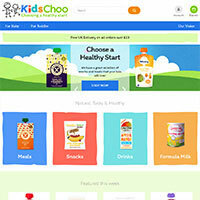 KidsChoo, one of the leading UK retailers operating in healthy nutrition for babies and toddlers niche has put their confidence in our eCommerce web design capabilities, and we provided them with an online shop that has the potential to win this prestigious web design award. The competition is open until the 21st of May 2017, and you can contribute to the final outcome by voting on this link (www.bigcommerce.com/blog/design-awards-2017). If you wish to support us, you can vote up to 5 times a day until the final day of the competition. The award winners will be announced in mid-June, and we have a great opportunity to win one of the prizes as we are currently leading the race! This is the result of our years-long engagement in BigCommerce web design projects, and we are proud to say that our services in this segment fall under the very cream of the crop on the market. The accumulated experience from numerous projects we carried out in the past years made us understand the options available in the best possible manner, and enabled us to compete with the best web design agencies across the globe! We are looking forward to this challenge, and the opportunity to prove ourselves as the best in the field when it comes to BigCommerce web design, and your support is essential if we are going to make it! Of course, if you have a need for similar web design services, we are more than happy to meet you, answer all your questions, and design a website of the highest quality that would be able to compete on a very same level as KidsChoo! Feel free to contact us via our email or via phone at any time!